From King Shaka International Take N2 North Coast / Stanger. 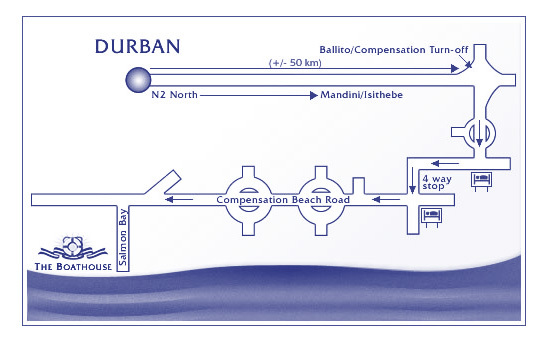 Drive about 1 hour and 15 minutes, take the Ballito / Compensation turn-off. Follow this road, past all the traffic circles (you will pass shopping centres, a BP fueling station and Caltex fueling station) until you reach a T-Junction. Follow the road down till you get to a 4 way stop. Follow the road past all the shops and traffic circles.